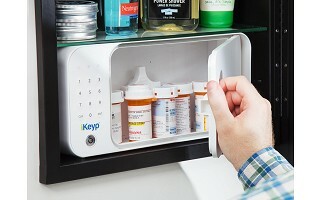 Makers Jeffrey Padilla and Mitch Danzig had medicine on their minds when they created the iKeyp smart safe. They wanted to keep pharmaceuticals out of the hands of young children and anyone else who shouldn’t have them. With its humidity-sealed storage compartment and ability to send medication reminders, iKeyp is a perfect way to keep pills safe and accessible. But Jeffrey and Mitch quickly realized that iKeyp is also a great way to keep cash, passports, and other valuables locked down. 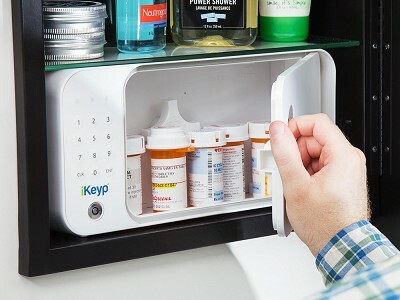 iKeyp is compact enough to store in deeper medicine cabinets, drawers, or bookcases. We think it's a particularly smart solution for shared spaces, like apartments or dorms. 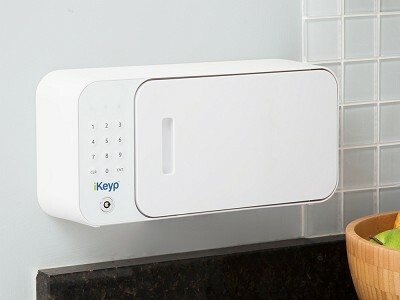 The safe can be opened by entering a pin on the keypad, with a back-up key, or remotely through the app. The app can send visual and audible alerts for things like failed keypad attempts or if the safe is moved, enabling you to double-down on security from anywhere. What is the average battery life? Average battery life is 4-6 months based on opening the unit twice per day. What is the difference between the Bolt version and the Pro version? The Pro is equipped with patented expandable wings make for a no-tool and no-stress installation anywhere. The Bolt version, along with all of the standard features, comes equipped with a metal back plate with screw holes, making it easy for you to install it on a wall or cabinet, but difficult enough to deter others from detaching and walking away with it. Are you able to check its location within the app? No. There is no GPS in the unit, but once installed and the tamper alert is set you will be alerted if anyone tries to move your safe. What aspects went into the design and construction to make it secure and durable? It is made of a proprietary blend of ABS/Polycarbonate for strength and durability; the Pro has metal wings for more sturdy installation and the Bolt has a metal plate in the back to allow for strong wall mounting. How watertight is the safe? The keypad is water resistant and the top of the unit was built to slightly tilt forward so if anything spills on top it will run off. The unit has a humidity seal, but is not watertight.